YogaFit Kids: Why Yoga as Fitness for Kids? Why Yoga as Fitness for Kids? Why Yoga? Yoga is not only the oldest form of physical fitness in the world, it is also the most available to people of all ages. Children come into the world as natural yogis. Their joints are pliable and their muscles are flexible. Yoga encourages kids to explore their natural flexibility and to become stronger through natural and functional physical movement using their own body weight. Today, children are under a lot of stress. Endless homework and activities, pressure to compete, and family schedules can contribute to anxiety, tension headaches, and nervous stomachaches. Yoga counteracts that stress and gives children tools to cope. Learning to be comfortable working with an inward focus – “Within"
YogaFit Kids is designed to appeal to teachers, parents, and children interested in a remarkable instructional tool for introducing a better approach to health and fitness for children. 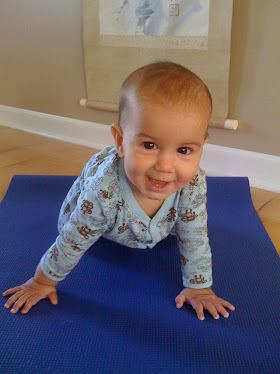 YogaFit Kids is based on the ancient tradition of hatha, or physical, yoga. YogaFit Kids was developed to provide a wonderful opportunity to introduce the benefits of yoga to children in a safe, enjoyable, inclusive format. While based on the proven benefits of a 5000 year old practice, the YogaFit Kids practice creates a safe environment for all beliefs. How Fit, or Unfit, are Kids in America today? Overweight is the most common health problem facing U.S. children. Data for adults suggest that overweight prevalence has increased by more than 50% in the last 10 years. Data for children also suggest that the prevalence of overweight continues to increase rapidly. Between 1986 and 1998, overweight increased significantly and steadily among African American, Hispanic, and white children. By 1998, overweight prevalence increased to 21.5% among African Americans, 21.8% among Hispanics, and 12.3% among non-Hispanic whites. In addition, overweight children were heavier in 1998 compared with 1986. In addition, kids are less active than ever, especially city kids. The Harvard School of Public Health reported that from 1963 to 1980, obesity among children increased more than 50%. According to evidence collected by the Centers for Disease Control, American children are clearly becoming more fatter and less fit. Its not just body composition or the condition of being overweight that is frightening, it is the daunting health consequences of this extra weight and inactivity for children. By the age of ten, 30 to 60 per cent of our youth’s population will have at least one risk factor for heart disease. (2000, AFAA, p. 4) This is due, in part, to poor nutrition and to more sedentary lifestyles that emphasize technology over movement. Yoga is a way for children to enjoy movement, build self esteem, and take responsibility for their overall health.